Every holiday has its geography. Thanksgiving and Christmas are domestic. People hole up in houses, locked in living rooms, huddle with fires and TVs and set themselves against the long winter dark. Summer holidays, like Memorial and Labor days, are outside under skies and in yards or parks with picnics and barbeques. The 4th of July is fireworks, the way they burst high above the city, creating horizons of light embracing entire cities. Halloween is different. Halloween flies in the face of everything about our modern era of paranoid parents, media hysterics, over-protected children, and privatized communities. 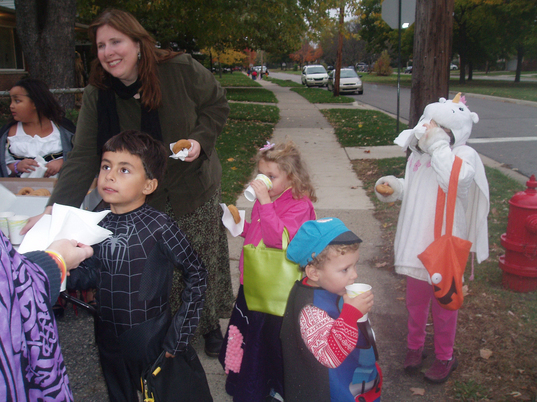 Somehow, through the magic of Halloween, parents actually want their kids to wander the city, approach random homes, and take candy from strangers. People are encouraged to dress in creepy ways and be weird. Instead of holing up in your house and gathering possessions onto a dinner table, at Halloween you pace behind your door and wait for the doorbell to ring. You hang out on your porch and watch your neighbors pass by. You wander the streets in the evening, kicking leaves into the gutter and looking for pumpkins. Halloween is the sidewalk holiday. Somehow, Halloween reconfigures the social orientation of US cities, taking people that are normally homebodies and dragging them off the couch, taking kids out from their electronic bedrooms and fenced-in yards and, using the surefire lure of sugar, demands that they aimlessly wander the streets. Younger kids walk clutching parents’ hands, while older kids form elite trick or treating teams, action squads of exploration that map out yards and streets of whatever part of the city seems to hold the most lucrative blends of corn syrup and Pennsylvania chocolate. Halloween gives kids trotting twixt front doors a gift that will haunt them for years, lingering twilight giggles of city memory that lay a foundation for urban mystery. Early memories of walking winding streets past dark homes and wondering, “who lives inside?” and “why aren’t they giving me candy?”… these are precious city seeds. The first discovery of a new street, a little trail connecting the park to the back road, sticks with you like a cockleburr… these are the first steps of a lifelong road of alleys and lanes, of possibilities and potential people you might become. Every holiday makes its own city. The Thanksgiving city is nothing but living rooms, dinner tables, and doors sealed to the outside, homes linked only by telephones and TVs. The Christmas city is a forest of chimneys, churches, and shopping malls. But the Halloween city is wide open and linked by endless strolls. It is a city made from porches and doorbells and strangers and shrieks of laughter. Halloween is the holiday of sidewalks. Halloween, MY BIRTHDAY, is the greatest holiday. I like to think of Halloween as the Super Bowl of pedestrianism. This article is in a similar vein, though I think you capture the magic of the night better, Bill.